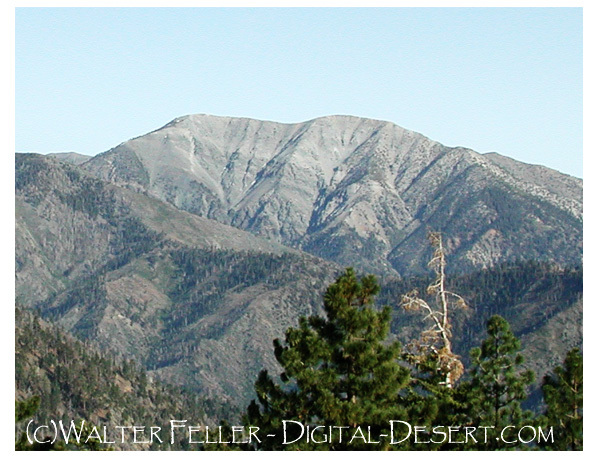 This subsection comprises the higher and cooler parts of the San Gabriel Mountains. The climate is temperate to cold and subhumid. MLRA 20e. Lithology and Stratigraphy. This subsection contains mostly Mesozoic granitic rocks and Pre-Cretaceous Pelona schist. Also, there are some Pre-Cambrian plutonic and metamorphic rocks and small areas of Quaternary alluvium. Geomorphology. This is a subsection of steep and very steep mountains with narrow to rounded summits and narrow canyons. The mountains trend east-west. The subsection elevation range is from about 5000 feet, or lower on north-facing slopes, up to 10,080 feet on Mount San Antonio (Old Baldy). Mass wasting and fluvial erosion are the main geomorphic processes. Soils. The soils are mostly Lithic Xerorthents, shallow Entic Haploxerolls, Lithic Haploxerolls, and Xerochrepts. There are some small areas of Xerofluvents and Haploxerolls on Quaternary alluvium. Most of the soils are leached free of carbonates. The soils are well drained. Soil temperature regimes are mostly mesic, and some are frigid. Soil moisture regimes are xeric. Vegetation. The predominant natural plant communities are Coulter pine series, Mixed conifer series on the south side, and Jeffrey pine series on the north side of the mountains. Lodgepole pine series is common at the highest elevations, and Limber pine series occurs on dry slopes. Grasslands: Beaked sedge series, Bur-reed series, Shorthair sedge series, Tufted hairgrass series. Shrublands: Bush chinquapin series, Chamise series, Deerbrush series, Eastwood manzanita series, Greenleaf manzanita series, Holodiscus series, Mixed scrub oak series, Mountain whitethorn series, Parry rabbitbrush series, Rothrock sagebrush series, Rubber rabbitbrush series, Scrub oak series, Scrub oak - chaparral whitethorn series. Forests and woodlands: Bigcone Douglas-fir series, Bigcone Douglas-fir - canyon live oak series, Birchleaf mountain-mahogany series, Black cottonwood series, Canyon live oak series, Coast live oak series, Curlleaf mountain-mahogany series, Coulter pine series, Coulter pine - canyon live oak series, Incense-cedar series, Jeffrey pine series, Limber pine series, Lodgepole pine series, Mixed conifer series, Mixed subalpine forest series, Mountain juniper series, Ponderosa pine series, White fir series. Climate. The mean annual precipitation is about 30 to 40 inches; much of it is snow. Mean annual temperature is about 40° to 50° F. The mean freeze-free period is about 150 to 225 days.